Back in September, roughly a couple of weeks before the launch of the Samsung GALAXY Note II, Samsung's top mobile dude made a prediction. J.K. Shin said that the Korean based manufacturer would sell 20 million units of the phablet in one year, twice as many as the original generation model sold. Once it became apparent that the device was going to sell like hotcakes, the clicks of the counter started to drown out all other noise. Inside a month, 3 million units had been sold and now, the latest count from the Korean manufacturer shows that 5 million Samsung GALAXY Note IIs have been purchased globally. At this pace, Shin's estimate might be a bit light. We also wanted to show you the latest ad for the Samsung GALAXY Note II. The spot shows how the device, and the S Pen, can make people creative, especially when making a unique birthday card. If you haven't seen the commercial on your television yet, click the play button on the video below. Sammy seems to have another win with the Note II. There is a lot to like about it. My only question is how long to the Note III? This is the best smartphone to date...period! Granted the size isnt for everyone thats why it may not sell as fast or as much as the S3 but nothing beats the sheer number of features on this phone and that too features which are useful and fun! Note 3 is gonna be EPIC (yes in caps due to size!) 1080p SAMOLED (alternative arrangement like Note 2) Exynos 5 quad or even 8 Core (ZTE has announced so expect Sammy to compete) 3 or 4 gig DDR3 RAM Tactile display 4000mAH battery sd card slot S pen (improved) with more buttons and functionality and last but not least,..... Android 5.0 Key Lime Pie Baby! I just got my first hands on with it today, and to be honest, it isn't such a niche product as I had once thought. Now, I don't think I have huge hands, but it was oddly natural to hold for me. It wasn't too big, it rested in my palm nicely, and one handed use was more easy than I had imagined. The size was practically perfect for my hand, and I'm only 15 years old, so I think there are people with larger hands than mine that could wield it more easily. Entirely more manageable than one might think, I was surprised. Performance (in the short time I had with it) was pretty amazing. NO lag whatsoever, I tried as hard as I could and I could not slow it down. Instantaneous reaction time to whatever I did. Build quality was also more solid than I had expected, though there was a bit of creaking and the S-Pen felt a bit odd (for lack of a better word), overall it was nice, but it doesn't hold up to HTC or Motorola. Samsung deserves those 5 million units and all the more, great work. Though, get a new designer, would you? Are you talking about size or build quality? Either one is understandable, but I still don't get how the Note II could possibly feel that natural to me in terms of size. One of two things are going on; 1) My hands are huge. 2) The Note isn't as unwieldy as most are led to believe, and fit more people's hands than once thought. I was speechless when I held the Note II and it felt comfortable. If there were a Motorola, Sony, or HTC equivalent to the Note II (5.3"+), the only thing that *might* pry me away from it is a Nexus. But there is no such device, so I'll get the Nexus 4 and wait until next year to see if there is a quality built phablet that may or may not be a Nexus. Are you going to get the xperia t.? Yup and there's more to come! But according to a certain Samsung hater, those who bought the GNOTE II are the same people who already bought the GSIII this year. So actually, SS is not doing very well, it's just that the SS fanboys are ruining themselves to support SS. LMAO! Dont worry the next iphone will get bigger beyond the 4inches. WATCH. hah... alot of people buy the iPhone just because of it's size, if it gets up to the galaxy note size it's gonna sell like crap. because you miss the point. 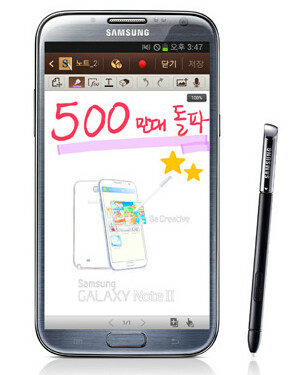 galaxy note ii for creativity and productivity. I think they will sell many many more once it becomes available at Verizon. it might be more comfortable in the hands because it's now a 16:9 aspect ratio (narrower + taller) form factor vs Note's 16:10. I was surprised myself, seeing the Note + Note II side by side, the original actually looks bigger than the II. Wish they would of such with the same ratio though. I got my Note 2 on Wednesday!!!!! Damn you Verizon for being so slow. This phone should have came out before the DNA. I got mine on Black Friday. Best phone ever. The fluidity of the multitasking blows me away & so does the battery life. After I fully charged it, I got 30 hours of heavy use out of it. I'm sure once I stop picking it up every 5 minutes, I'll be getting 3 days out of it easily. I'm a believer. Samsung has shown me the way. EDIT: 5 million sold in 2 months & it's still not out on AT&T & Verizon, the biggest carriers in the U.S. This phone will sell 20 million in a year easily.